Ark's Ark- Sailing on the ocean of MMORPG! Sailing on the ocean of MMORPG in search of the dry land of the perfect game. This particular page, as you may well notice, has been out if use for a while. I've been using Blogspot, and my forum, and such. But now, thanks to the wonders of Wordpress, I have pooled all my bits here. I need to fix it so that page is what you get instead of this page. Like a phoenix from the ashes! Like a slice of pizza discovered 'pon a hungry hungover morn! The Ark has once again been released from drydock to ply its trade anon. No fancy graphics yet. Just the goods, pure and simple. But, as I have said all too many times, t'is good to be back. And this time, hosted by my dear pal Frank, it's highly unlikely there'll be any dissappearing nonsense. However, theres a hitch. I'm not actually playing any MMORPGs at the moment, and am somewhat disinterested in starting any of the current batch. So, the theme around here will be changing. To what, I am unsure, but it'll all work out. Ok, update time. Been back on the internet for a while. And like true suckers for punishment our crew has once again sailed for the land of Dereth, to do battle for the future of the world. Til now we've been members of the Strudel allegiance, but in recent times it would appear that our noble monarch has ceased to play. So forth we have gone from Strudel, and the Green Lodge lives once more! AC2 has problems. Big problems. It's as if they've forgotten everything that has been learned about building a MMORPG in the last five years. But that will not stop our crew, and their new friends, from trying to bring the message of justice to the troubled masses! For now, I'm just going to enjoy being free of commitments for a while, but the situation within the Order of Dereth cannot be left undealt with for long. None truly uphold the teachings of Asheron. The Green Lodge shall! It's been a good six months since I've been able to do this, so pray forgive me if I come over all weepy. This is the resurrection of the site, from a rather incomplete and out of date backup. What happened to the previous incarnation is a tale of woe, involving homelessness, poverty, starvation, and lack of internet access. Happily everything except the poverty is fixed, so we can get on with things again. But a lot has changed while we've been drydocked, and a great deal of what I say further down this page now looks rather outdated. And a lot of the funniest stuff is still eluding my backup searching. I don't have time to give it the complete overhaul it deserves right this moment, but suffice it to say, we're darn glad to be back! So, what's happening? We're active in everquest again, and are now hosting the forums for Arcane Sanctum. Also playing about with Morrowind, and NeverwinterNights. Where the Ark itself is headed, not entirely certain yet, but you can be sure it's going ... somewhere. Ah, sweet Britannia. No matter how far I travel, I know in my heart that I will never find a land so rich. Dereth, with it's pretty vistas might be more beautiful; Norath might permit my friend Dulcien to take his true gnomish form, but only the rulers of Britannia actually have the slightest clue as how to govern a land like ours. Only in Britannia is there any sort of culture amongst the people, of the sort I can feel part of. How many people have run up to you in Everquest, and just hit the join button without even speaking to you? Communication beyond "sow plz" is a cherished luxury in Norrath. I'm not even sure why it is the way it is. Maybe the restrictive first person perspective, without the peripheral vision and natural headturning of RL, equates to a sort of tunnel vision where people fixate only on what is directly ahead of them, and their current goals. Stopping to chat, unless you want something from the person involved, doesn't play a part in this. Adding the ability to talk to people you already know via telepathy no matter the distance, there is little need to extend your circle of friends. I am happy to hear that UO2 won't be having any zone-wide shout commands, but I will be interested to see whether the first person perspective causes a similar result. Maybe the more customisable camera angles will permit a wider view. Ah, in any case, t'is just a theory. Whatever the cause, my firm belief is that people are friendlier in UO, and that is a key thing that Origin, Verant, and all the thrones and dominions yet to be would do well to understand. If graphics, or other fanciness were the reasons we gamed, we'd be playing Final Fantasy. We choose to MMORPG that we might interact with others. While not all of us will choose to interact positively, we will interact. If you'll grant the debatable premise that interaction is the primary motivation of the MMORPGer, then it is obvious the best game will be the one that allows you to interact in the best ways with the best people. So what are the best ways to interact? They will be immersive in the game setting. If our only purpose was to interact, then we would be on IRC. We want to interact to a purpose. In the case of the roleplayer, the primary purpose is the mutual reinforcement of a shared reality. As such long-range communication is damaging to this, unless there is a reasonable magical or technological explanation for it, and it should never be as easy, or cheap, as talking to someone in the same room. a) Understand that you are a real person, with real feelings, beliefs, and goals, which are just as important to you, as their's are to them. b) Sometimes talk to people, just because they like talking to people. Not because they want money, or enchantments. Note. Talking about communication, I've always thought a wonderful addition to a game would be a mail system, in which PC could send mail to another PCs home. They would post the letter at a local post-office or post-box, which would be collected by an NPC postman and taken to a town post-office. Mail to the same town would then be distributed by another NPC (or maybe just automatically appear in the Player mailboxes). Mail transfer between the cities, however, would be a job which PCs (of good reputation)could take on, for cash, taking the (unopenable, unlosable) mailbag to the relevent cities post office. Perhaps there could be something about the mailbag that prevents the use of teleportation magic when in possession of it, so PCs have to make the journey mundanely. Of course, to prevent mail from being stolen, which though realistic would be unecessarily irritating, if a letter did not arrive at the post-office within reasonable time, it would be included in the next mail-parcel to be sent. A PC who did not deliver mail he was entrusted with in reasonable time would be penalised. This system could even be expanded to permit pictorial postcards from different cities, holiday greeting cards, and even the postage of bankers drafts. It would also be an excellent and immersive method for sending any non-urgent announcements, rumours, or in-game news that the GMs might wish to send. I find the idea of an adventurer arriving home after a long journey and finding a pile of letters on his doormat amusing, for some reason. A PC with his own home would naturally expect his mail to be delivered to his door. PCs without a home would have a PO box at the post office where they could pick their mail up. Hurrah! Another way to make money for non-combatants! A reason to use ships! This would be a spiffy addition to UO, in my humble opinion.. When is a game not a game? When it's your profession. Many moons ago, Yarblek offered me a job running a chain of superstores across Britannia's shards, on account of the success of my shop on Drachenfels. Back then I was rather more idealogical. There are enough small shops being put out of business by supermarkets in the real world without starting the trend in game, I thought. I was also against the convertion of Britannian gold to American dollars. Thus I refused, albeit with a sense of missed opportunity. These days I'm rather less naive, and rather more cynical. I'm not the only one, it seems. Dollars can buy you anything you want; gold, items, friends, or even a ticket for a dragon-raid. There's even an enterprising group that will play your character for you, if you're trusting enough to give them your password. That cash and gold are so easily interchangeable makes the act of scamming all the more villainous. In the USA criminal charges have been successfully made against a scammer. Hurrah, and all that. Maybe after a few more lawsuits like that, scammers will start to think twice. Speakin' of groups which make a real dough from gaming, I reckon Verant's naming policy might need a bit o' work. On Tholuxe, I bumped into a character called Uberbuff You. Now, I can understand how first names can slip through, but as I understand it, surnames require GM intervention. A new server, a new chance. 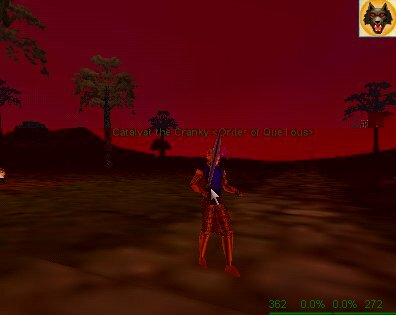 I remember when the only new Asheron's Call server so far was put up, I migrated there instantly (Not having had it all that long anyway) with dreams of being a mighty monarch, renowned across Dereth. Of course, several thousand other people had similar ideas, and several strong allegiances migrated wholesale, putting pay to my cunning plan. Similarly, when Tholuxe Paells started up a couple of weeks ago, I couldn't resist the lure of an economy where patchwork armour might actually be sellable for a while. Yesterday though, I encountered my first seriously twinked 1st leveler. He was wandering about with his staff of the observers, asking (roughly once every 30 seconds) where to find the Steamfont newbie zone. Presumably the guild he had already joined had provided the items. While Gordon sings the praises of Everquest's player economy at least once a week, it is not an economy in any real sense of the word. I chose Tholuxe due to its not being a split server. This prevents instant uberguilds which often arrive to "own" the server, due to Verant's policy of under the counter guild transfers. I am somewhat famously rubbish at levelling, spending far too much time chatting, drinking, crafting, and taking pretty pictures. At least on Tholuxe I am not quite so embarrassingly far behind everyone else, and heck, people really do buy my, er, Dulcien's, patchwork. It's a far cry from UO though. In levelless games folk are prepared to spend less time hunting the sacred xp, and a bit more time socialising. In UO it is not an especially difficult thing to master most skills, particularly now we have the skill-burst period. There is still a hunt for gold, but it is possible to make money from positive interaction with other PCs. The greatest joy I ever had in UO was the running of a little shop, and becoming friends with my customers. Anyway, where I'm trying to go with all this is that firstly, I think that the psychological need to level is detremental to the game. The idea that one 60th level character could (if EQs ultra-restrictive PvP rules permitted it) feasibly lay waste to an infinite number of 1st levellers, who could not land a hit or an unresisted spell without a pretty amazing fluke of the random number generator, is abhorrent. It works in AD&D because all the players are of similar level, and there is a constant DM presence to make things work in a sensible way. In a MMORPG, for someone to be able to take 60 times more damage than someone else is simply ridiculous. UO took the brave step of trying something different, then EQ took us right back to the stone age. (I'll give AC a break here, as although it has levels, they're pretty meaningless, and it is more skill based than anything else. there is still a constant imperative to gain xp though. At least they tried something different.). Sure characters should improve over time, but it should be on a far more sensible scale. No more level based games! Secondly, what we really need, is an end to all these different shards and servers. Multiple servers are attractive to games companies for one real reason: They can reuse the same world content on each server, rather than needing to create a game world big enough for all the players. I don't buy the usual argument they give, that hardware requirements to run a single world would be prohibitive. In Asheron's Call, where there are vast tracts of land never visited by players, I don't understand why they didn't do this. All it needs is some new towns, which they have shown they can create and destroy at will even after release, and there'd be plenty for everyone, er, probably. The advantages of this are multiple. On a mundane level, a pooled support team would be far more efficient in dealing with problems, and only one server would have to be patched and maintained (though it's heightened complexity might make this tougher). Storylines (which generally have to be designed to have the same result on each server) could be far more tailored to the antics of the players. Most important is the social aspect. With the population pooled, it means that whatever your playstyle, there will be far more folk who share your ideals. With a larger gameworld, they might take a bit more finding, of course. But roleplaying communities, which tend to draw people to them (if you build it, they will come) would find it much easier to establish themselves (given that all MMORPG companies refuse to create roleplaying servers, damn their eyes.). With no other servers to swap between there would be a lot less of the mysterious dissappearances which plague all games. Shreddies, a breakfast cereal made by Nestle, have a new slogan here in the UK. "Too tasty for geeks.". In an short animated advert, a spotty bespectacled short-arse displaying a complete lack of social skills, complains at his brother's modern music interupting his reading, and is then overcome by the taste of frosted shreddies. He ends up sitting in the kitchen sink as a voiceover and text proclaim that shreddies are too tasty for geeks. I've only just seen the advert for the first time, so I can only assume that this is the beginning of a fresh advertising campaign. Do Nestle have any idea of what a geek is? Have they given any thought at all to whether someone might be offended? I am struck that this advert is probably the product of some trendy London advertising company. Faced with the problem of trying to make sugar-coated cardboard exciting for children, they have decided to capitalise on the ill-treatment of those who are probably already the least popular members of the class. What's that? You were expecting some sort of MMORPG related content? Humm, fair point.. 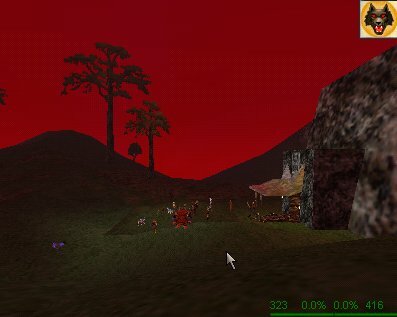 In it's latest patch, not only did Asheron's Call manage to destroy two whole towns, but it managed it first time. Turbine had the foresight to design a game that could have such major geographical changes with the minimum of fuss. 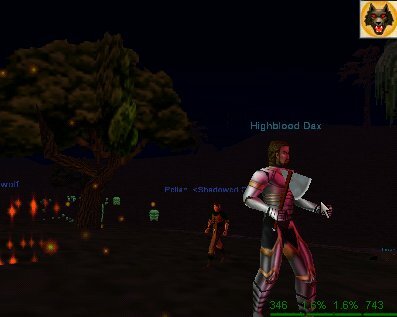 Everquest completely rules out any major change to existing content (though they seem to find the time for yet another add-on disk). Ultima Online have just added the first new dungeon since the second age, and by all accounts it is a fine addition. A complete rehash of the other dungeons is also planned. The inability of EQ's world to change is certainly one of it's greatest weaknesses. In the long term a game world has to be dynamic in order to keep players. UO has a lot of dynamism built in, in the form of player housing, vendors, and guilds, even though the storyline tends to progress regardless of player activity. I always feel that in Everquest, my ability to affect the world, or even my fellow PCs is severely limited. It is a truly static world, with a little girl always missing, a rebellion always brewing, and a murderer sitting about in a bar waiting to be killed again. In such a world the only variety is provided by the other players. Shame most of the players choose to play in a style rather less than varied. At least it's the player's fault according to Abashi, rather than any fault in the game-design, and disagreeing with him is a somewhat unhealthy pursuit these days. Arksark.org is now up and running. I haven't tried to get the email working there yet, so for now keep on using the .uk for that. I'll be putting a redirect in at the .org.uk in the near future, but for now I'll apply updates to both. Well, as you might tell from the messageboard, I've cooled down nicely from my Highblood Dax adventure. Online RPGing is one great cycle of anger and forgiveness, I find. In any case, I present to you a new feature, 2 by 2, that came to us in the pub this afternoon. It's in a bit of a rough state, but I couldn't wait to get this out. Neatness will be forthcoming..maybe. If you have any facts or pictures to add, consider this a living document, to be updated at leisure, and send them in! Ah, while I remember, we've just registered arksark.org, and this site will be moving there presently, onto our own (Well, GLT's) dedicated server, so I can run CGI of my choosing and all. I'll leave redirection here when it moves though, so you won't lose us, er, unless you want to. Last night on Quellious the sky turned red, and everyone normally in the Qeynos hills died as a horde of undead descended. Then a large number of high level types showed up, killed all the undead, complained there weren't more and how this event sucked, and went away again. The end. Er, alright then. Maybe if I could go find him I'll find out more. I caught up with Mr Dax and was about to attempt an interview when his horde jumped on me. I did get a couple of pictures of him (1, 2), but they tell us little of his motivation. It was an experience, in truth, that has me seriously thinking of returning to UO as my main game. EQ is seemingly devoid of all roleplaying. My log of the event (utterly raw and unedited I'm afraid. )shows all cursory attempts at roleplaying swamped by people who simply viewed the event as a sort of PvP between themselves and the GMs. Maybe it was. This was admittedly my first EQ event (Europeans have to stay up to 4 am to even see the beginning of them generally. ), but I saw no sign of foreshadowing, or any plot for what happened. It really was just a bunch of monsters showing up to trounce us til the high levelers came running in. If we're to be subjected to an influx of warbones and skeletal monks, is it too much to ask that our deaths have a little meaning? If it is simply to provide high level folk and GMs with PvP jollies, could it happen somewhere other than a newbie zone? The site is properly live now. We've managed to bubble our way into the search engines, and a few good sites have been kind enough to link to us. On the update front, a new question was received, regarding the sewers of Qeynos, and it has been dealt with in our question and answer column, Ask Ark. I finish my current job on Wednesday, so you should see rather more regular updating henceforth. I was rereading Dulcien's little adventure, and it poses an interesting question. Where does the character end, and the real person begin? In the story, Soul, a member of the Emerald Knights, was revealed to have the same player as a notorious miner-killing PK. This came about as a result of an unfortunate misjudgement on his part. Although he claimed he kept his characters seperated, it is blatant that he did not, or else he wouldn't have ended up in the mess he did. Now in roleplaying terms, in that situation Soul was indeed helping Black Ice (the PK) in evading justice. If that had not been the case, and the truth had come to light in some other way, would EK have been right to have discharged Soul from their midst? My own thinking is that while it would be dubious, from a roleplaying perspective, to discharge a guildmember who has a PK character, to not do so would be more untenable. The player in question is basically playing for both teams. He clearly has no philosophical problem with PKing, and may gain information that will be useful to him in his murderous career. EK, being a noble guild, with strong anti-PK beliefs, had no choice but to discharge him upon discovery, even had the discovery been less dramatic. This is because, in my eyes, certain forms of behaviour go beyond the character; beyond just playing the game. Exploiting and scamming for instance. PKing in UO, for the most part, is also one of these. The UO community is divided in countless ways, but even most PvPers would agree that slaying miners and newbies is the height of moral poverty. That someone would choose to do it as their regular playstyle reflects on them as a person, as well as on their character. The key to playing an anti-social character is to keep your identity completely secret from those who might not share your morals, or who cannot be trusted not to keep their mouths shut. Playing the roleplaying card after your identity is discovered is too little, too late, and will not help you. Oh woe! It looks like Dark Zion, the brainchild of Wombat Games, which I mentioned back in June, has fallen by the wayside. It had looked a damn sight less generic that many of the upcoming titles, and I suspect that's why they apparently could not find a publisher in time to save the project. Ahem. You might well be wondering quite what is going on here on the ark. Fear not! Much is happening behind the scenes not readily apparent. Feeling rather let down at not being invited to sit on any of the new government quangos, we decided to set up our own "think tank". So we've been sitting around "brain-storming", "mind-mapping", and generally making colourful graphs, and powerpoint presentations. Most tiring I can tell you. Well, except for Dulcien who slept through most of it. Grrr, and Zandabar with his bloody grind, grind, grind, throughout. Humm, and Cyndylon got eaten by Vox on the "team-building" exercise. Ye know, this consultant Holmwood got in to advise us hasn't been a complete success, all told, but we did manage to sell a few of the graphs to the Tate, so not a total loss I suppose. Bah! Fie to all this business talk. I'm off "ale-drinking"! It's a given that there are plenty of sites covering similar material to ourselves. Of course we believe that we can do it with far more style, but that's rather subjective. So we're having a bit of a think (without all that modern nonsense this time!) about what else we can do to make this site unique, before we go letting visitors in. Any suggestions would be welcomed, of course. Hey ho chaps. Sorry for the lack of updates, but what the hell. Site's not even supposed to be live yet. Arkenor is presumably writing some great disertation on the philosophy of MMORPG design. Good for him. Personally I've been beating the living daylights out of people in the live-beta test of Shattered Galaxy. It's not a roleplaying game per se, but for online real time strategy mayhem it can't be beaten. Upon logging in you are given the opportunity to create a character. You know the drill by now. Allocate stats, pick what you look like, pick a name, and choose a team. Nothing too surprising there. There are four sides in the conflict, and needless to say I chose to associate myself with the righteous forces of green. Once you're through all that you appear in an isometric world, in your faction's capital city, standing in front of the local army-surplus outlet. Luckily you seem to just cashed in your Microsoft shares, and so you may wander in and buy fully combat-ready troops immediately. "To battle!" thought I, and off I trotted across a map consisting of some 70-odd provinces to an area where my comrades looked like they could use a hand. The map handily shows you how many folk of whatever colour are in each province, and whether there's any argy-bargy going on. A quick moral boosting speech to my minions, and I stepped through the portal to the warzone. My squad of mighty robots appeared upon the other side of the portal. It took a brief moment to figure out how to select them, and make them lumber about a little. Alas, a moment too long, as they suddenly chose to burst into flame and fall over. I had discovered the power of artillery. My troops destroyed, I found myself back on the other side of the portal. The enemy, it seemed, had cunningly managed to sidle around my fellows, and get a bead on the entry portal from my zone. No matter. I had not been thrifty at the shop, and had bought several other squads worth of mechanical deathdealers. Planes would be a better choice this time, so in I leapt. My planes, being immune to the cheap artillery tactics being used by the purple team wasted no time in seeking vengeance. The range on artillery isn't an awfully long distance, and it didn't take to long to find the guilty party, and so I began to strafe. Satisfyingly the arbalests (as the artillery were called) were not all that resistant, and one by one fell before my guns. As Ark will tell you, I've been around a while, and I know a bit about warfare. Communication on the battlefield is key. There is an everquest style chat window at the bottom of the screen whereby you can talk to an individual, all your allies, or everyone in the zone. My opponent was no stranger to this, and some horribly well-armed helecoptery things burst onto the screen, and started launching missiles at me. "Sod this for a game of soldiers!" I cried as bits of green plane began to rain down, when up came a victory screen. We had won, and I gained xp aplenty, both for myself, and my jets. The objective in a battle, is for the attacker to gain certain points of contention (pocs), and my jolly green co-fighters had done just that. Winners also receive money and minerals, for buying upgrades. Ah, upgrades. The kit available to you at the beginning is limited by your level, and 2 of your stats. As these increase new unit types and upgrades become available. The opportunity for customisation is seemingly vast, though an awful lot is still unavailable to me. Since my early days I've got to know a lot of my team, what sort of troops they favour, and the sort of stupid things they're prepared to do to nab that poc from under purple (greens main enemy at the moment. I expect it changes over time. The yellows look like they need a kicking..) control. There is also a political system of sorts. Each faction member may vote for the post of commander. There will be other posts later, but these are not implemented right now, but it adds a little more depth to what might otherwise be glorified command and conquer. Shattered Galaxy's true strength though, is in the sheer number of possible participants in the battle. I have taken part in conflicts involving upwards of 30 squads. The game pauses for all concerned when new teams enter the battlefield, which can be annoying, but this makes the game much fairer for those of us with only dial-up modems. Apart from that there is surprisingly litte lag, and certainly none to the extent where it gets you killed. It is a beta though, so expect the occasional bug to come up. With the ability to get stuck in and make a difference straight away, SG is great for when you don't have the time or inclination to wander for half an hour across Norath to find something worth killing. Not that I play that sort of fantastical nonsense anyway. I'm holding out for WWII Online. Bah! My ghouls have been to every shop in London, and there's still no sign of Vampire the Masquerade. One has heard some disturbing rumours as to it's quality. Personally I am unconcerned as to how good the single-player game is. It is the storyteller mode which will set this offering apart from it's 3rd person ilk. I hear that the multiplayer offerings currently available mainly involve logging onto a server, and the storyteller dropping monsters to kill. Providing the tools are made available I am hopeful that this will mature into a rich roleplaying experience and that I will regain my rightful place as Prince of Norwich! Hmm, one out of two would do, I suppose. A deluge is coming! Until now the world of MMORPG has seen roughly one release a year. Soon there will be as many as there are stars in the sky. (Roughly equivalent to the number of real-time strategy games and 3D shooters) Which ones will shine brightly, and which will fall to earth leaving a trail of broken dreams (and careers) behind it? Well met friend! I am Arkenor, and this fine vessel that ye see is my ark. and a Ventrue to lay down the rules. had brought their own shotguns and napalm. So there you have it. Each of us possessing certain vague talents that might come in handy. The perfect adventuring party in fact, which of course is what MMORPGs are all about. We've waited, ever since Pong, for the chance to take part in epic acts of daring-do. To meet friends, and exist in a virtual world which never grows old. What we've received are like waiting through a stream of appetisers, each tastier than the last, yet deep down craving a damn big steak. I can smell it though. Can you? That steak is being cooked somewhere, and we want a part of it. For now though, we might as well have a look at the imperfect, but occasionaly quite filling offerings on the table now. Humm, I'll try. What too can we do to make the games we have work better? The Professor has kindly volunteered to run a technical advice column. Those of us less familiar with 20th century concepts will be on hand to answer any other questions you might wish to pose, regarding gameplay, background, or how to get that cute wood-elf to group with you. While we don't know everything, we will do our best to enlighten.